On September 7, 1955 a baby girl was born to Carrie and Mitchell Adams who they named Camille Michel. Camille was educated in the Newark public school system. She resided in Newark, NJ until she passed away on March 29, 2019. 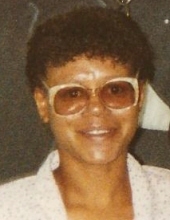 Camille leaves to mourn her passing: a son, Brian of Ohio; a daughter, Briana; her mother, Mrs. Carrie Adams; two sisters, Connie and Carmen both of Newark; a brother, Carl, and sister-in-law, Tia of Montclair; two nieces, Tanaha and Keyonna; two nephews, Cortez and Bashir; and a host of great nieces, great nephews, other family and friends. This Online Memorial has been created to commemorate the life of Camille Adams. Leave a message on the Tribute Wall to share your favorite memories and offer words of sympathy and comfort. To send flowers or a remembrance gift to the family of Camille Adams, please visit our Tribute Store. "Email Address" would like to share the life celebration of Camille Adams. Click on the "link" to go to share a favorite memory or leave a condolence message for the family.